This year marks the year that SCD planted roots in the community. From our new home studio opening in the Rosemary District to our third consecutive season presenting four main productions at the Jane B. Cook Theater, SCD has laid a foundation for contemporary dance in SRQ and has proven that we are here to stay. Our 13th season, "Rooted," offers the audience a deeper look into the heartbeat of Sarasota Contemporary Dance. The breadth of the work, of the artists, and the community is deeper than ever before. Join us for what is sure to be a versatile and ground breaking ride, with "Rooted." "Evolving/Revolving" is becoming SCD's annual homage to the 'upbringing' of Sarasota Contemporary Dance. The final performance of the season will be comprised of diverse, new works by past company collaborators and/or dancers as well as works brought back by popular demand. This year's production will feature Gerri Houlihan, Pamela Pietro, and an aerial work by SCD Co-Founder, Rachael Inman. Tickets: 941-359-0099 or click below! SCD’S studio improvisational group takes the stage! 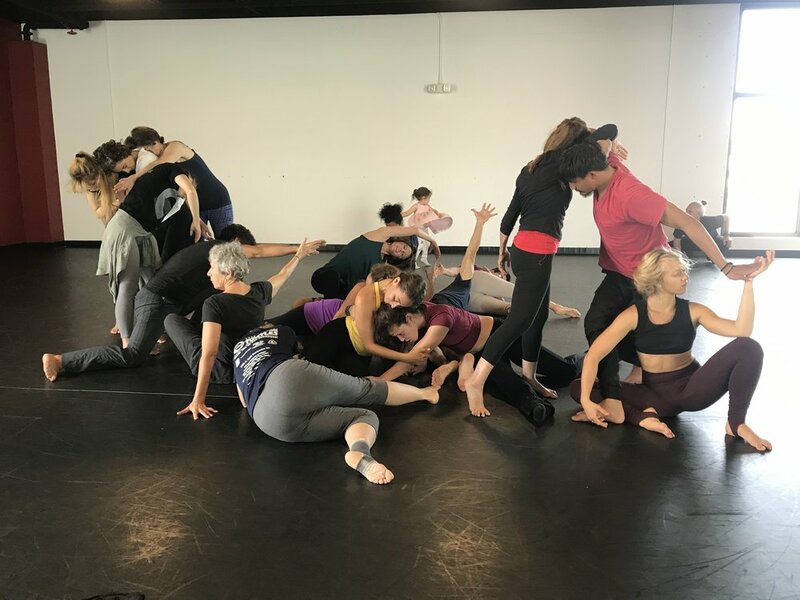 DANCING IN THE MOMENT began as an idea of Marsi Burns, a mature NYC Improvisational Dance Artist who wanted to bring Intergenerational Improvisational Dance as performance art/practice to Sarasota. With the support of SCD, DITM was founded by Marsi in 2019. They will be performing for the first time, May 10th & 11th at SCD’s Studio Home. The diverse group is made up of dancers and non-dancers, young and old, 17 to late 70’s and male and female who met in class. Watch beautiful, honest, sometimes fierce and funny dance making in the moment unfold which connects to the audience. Nothing is choreographed. But you would never know it!! SCD is proud to present our In Studio Performance Series - which has been designed to serve as an incubation platform for dance makers at varying stages in their career and creative processes. Conceived by SCD Artistic Director, Leymis Bolaños Wilmott, this series will offer a rare experience for choreographers and the Sarasota community to be a part of works in their birthing stages, as well as a unique platform for more seasoned dance makers to present new and exciting work in an intimate setting. We hope to see you at the studio! A sneak peek into the diligent rehearsal of two contemporary vaudevillians for a performance never to be presented…“Nostalgia” was created with support by CORE for Edge in Unexpected Spaces 2016. Catellier and O’Neal have been creating, performing and teaching together in Atlanta since 2011. They have performed their distinctive, sometimes whacky work in Atlanta, the Bates Dance Festival and the Florida Dance Festival. (re)Source, an investigation-in-process is an evening-length live danced and spoken artwork performed inside an audience-co-created installation which Bauman-Morales designed with scenic assistance from interdisciplinary artist Nontsikelelo Mutiti. Dance and choreography charge the space and are interwoven with original text, and strong visual design. In addition to solo improvised dancing and monologue within a score, the work includes live soundscape mixing and composition from original recorded scores which were created for (re)Source, an investigation-in-process by voodoo-electronica music artist Val Jeanty and by sound healer Shea Rose. Bauman-Morales dances through, with, in, and in spite of the visual, sonic and human landscapes which house (re)Source, an investigation-in-process. Within the work, she employs some of her families' history as a complex microcosm of race relations in the United States, digging in to the process of other-ing, being other-ed, and reclaiming radical connection.